It’s five and a half feet long. It weighs 8.8 pounds. Height of an adult female, weight of a gallon or so of gas—these are the critical dimensions of the carbon-fiber driveshaft running between the engine and the rear-mounted transaxle in the new Mercedes SLS AMG. We note this here because, despite the car’s retro-gullwing looks, the SLS is utterly bleeding edge—both in terms of its technical attributes and what it represents for Mercedes’ in-house tuner. 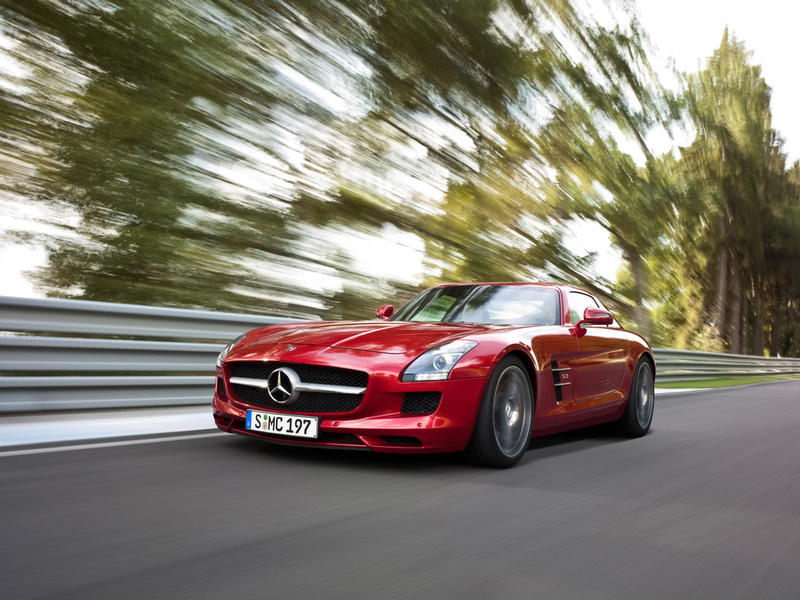 It is not simply a Mercedes with bigger wheels and a breathed-upon V-8 or V-12. It is, down to its churning carbon-fiber core, AMG’s first dedicated automobile and the very antithesis of the overly complex and overweight half-million-dollar Mercedes SLR McLaren. “The SLS is a serious super sports car,” says AMG chief of development Tobias Moers before taking a shot at the SLR, a carbon-fiber-bodied car that still managed to weigh in at 3858 pounds. “Our SLS weighs only 3572 pounds,” he says, nearly 300 pounds lighter than the McMerc. Keeping the 182.6-inch-long, two-seat SLS’s mass in check is its entirely aluminum construction (save for that driveshaft and steel A-pillars), a first for Mercedes-Benz. The aluminum structure weighs just 531 pounds, Mercedes says. Those gullwing doors look spectacular. Unlike with the original SL, where one had to slide over a wide sill because of the space-frame structure underneath, it’s easy to access the SLS’s cabin. There’s only one issue: Riders need long arms to reach the distant handles at the bottom of each door to pull them closed. The interior is simple and uncluttered, much like a current SL roadster’s. While the car’s structure is a pure AMG design, most of the parts, except for the shifter, are from the Mercedes bin. The instrument cluster is clear and easy to read, and we love the round HVAC vents. The center console has an aluminum finish, with carbon fiber an option. Press the starter button on the center console, and the now-familiar, AMG-designed 6.2-liter V-8 awakens with an angry yelp. The idle is deep, and the revs rise and fall race-car swiftly. Code-named M159, the engine is basically a reengineered version of the M156 unit that’s fitted to AMG’s “63” models. The M159 comes with an all-new magnesium intake, forged pistons in place of cast ones, and optimized tubular exhaust headers. The engineers also switched from a wet sump to a dry arrangement, allowing the engine to be mounted lower to benefit the SLS’s center of gravity. The maximum output of 563 horsepower is delivered at 6800 rpm, and peak torque of 479 pound-feet comes at 4750 rpm. In order to satisfy emissions standards—EU5, LEVII, ULEV—the Bosch ME 9.7 AMG engine management is set up to recharge the battery during deceleration. It’s another way of trying to eke out decent fuel economy, which, based on Mercedes’ European estimates, should equate to roughly 13 mpg city and 20 highway.